We are NOT currently seeking lifeguards for our WOODSIDE location for the summer of 2017. Lifeguards must be Red Cross or YMCA certified. Lifeguards work approx 10:30 am -3:30 pm paying approx $14-$17/hourly based on experience. 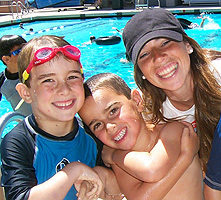 Extra $ available for those who teach swim lessons. Your actions can save a life. Lifeguards are hired because of what they are capable of doing in an emergency. Being prepared and acting quickly can save the life of someone in need. Develop leadership, public relations, conflict resolution and teamwork skills. Lifeguards are looked up to as authority figures around the water. As a lifeguard, you will be able to learn how to deal with conflicts between other individuals and between yourself and others. Learning how to handle tough situations and how to work as a team with other lifeguards can prepare you for how to act in other areas of your life. Gain discipline and decision-making skills that help prepare you for your future. Dealing with the rigors of a profession will help you learn how to balance work with the other elements of your life. Disciplining yourself to arrive to work on time and prepared for the day and accepting the responsibilities of on-the-job decisions as a lifeguard develops character traits expected by many colleges and future employers both in and out of the lifeguarding profession.  Prevent injuries by minimizing or eliminating hazardous situations or behaviors.  Enforce facility rules and regulations and educate patrons about them, as needed.  Recognize and respond effectively to all emergencies. This may mean using CPR, first aid, oxygen or an automated external defibrillator, if needed and only if trained.  Work with other lifeguards or staff when you need more help or equipment.  Stay healthy and fit. Emergencies often call for a burst of strenuous activity. Being fit helps you stay alert and gives you the energy needed to respond to emergencies. Exercise, eat properly and drink plenty of water to keep in top condition.  Use sun protection. Overexposure to the sun can cause sunburn, skin cancer, heat exhaustion and heat stroke. Preventing these conditions means using a sunscreen with a sun protection factor (SPF) of at least 15 and wearing clothing, like a shirt and hat, to protect your head, face and ears. Sunglasses with UVA/UVB protection for your eyes reduce glare from both the sun and water, allowing you to survey the facility with ease.  Avoid alcohol and drugs. As with any job, drugs and alcohol keep you from performing at your best. And when you have another person's life in your hands, you must be able to think clearly and act quickly. Using alcohol or drugs on- or off-duty can negatively affect your job performance and jeopardize the safety of others.  Appear professional. Being a responsible lifeguard includes being well groomed and wearing your uniform only when on duty. Rescue equipment should be kept with you and positioned for a quick response at all times. Keep interactions with others short and do not let them interrupt your primary responsibilities. And stay focused on your area of surveillance at all times.